A Passion to Perform – or Applaud! Ethnic Dance Theatre, a Minneapolis-based dance troupe that has been creating great experiences for performers and audiences since 1974, brought us along on a journey through the countries of Germany, Austria, Slovakia, Hungary, Croatia, Serbia, Bulgaria and Romania. It presented the history and culture of these countries in song, dance, and swirling colorful costumes of embroidered aprons, vests, ribbons, and jaunty caps. The show tickets were my gift for my husband (happy birthday, Honey!) 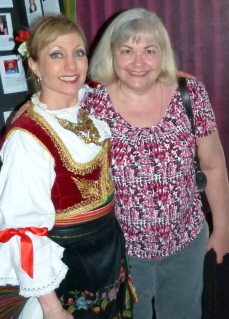 Our friend, Kathryn-Sonja (pictured with me in the lobby after the performance) is one of the dancers. We love to see the skill and exuberance she brings to the performance. During the show I was fortunate enough to be seated by a young girl who was bubbling over with excitement as she whispered to me that her mom was one of the singers. She joyfully sang along under her breath to the songs she had heard her mother practicing at home. I asked the girl if she was a singer too, and she told me she performed in the children’s choir at a St. Lucia festival in December. Here comes the next generation of performing artists! One of the best things about live shows is the interaction between the performers and the audience. We are in it together! I encourage those who are interested in the performing arts to indulge their passion—learn it, do it! The rest of us? We can support the arts by enjoying a show and cheering on the performers! I think the reason I was able to (finally!) 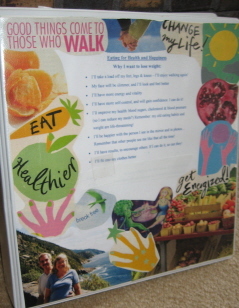 eat healthier and lose weight was in part because I created a colorful dream collage with a written list of my desired weight-loss results right in the center of it. It is one thing to know and believe something, but I think the key to a successful change in life is to keep your intentions fresh in your mind every day – several times a day to begin with, and ongoing as necessary! The new name “Realize Your Dreams” refers to all of us and our best aspirations—who we are and what we want to accomplish with our lives. 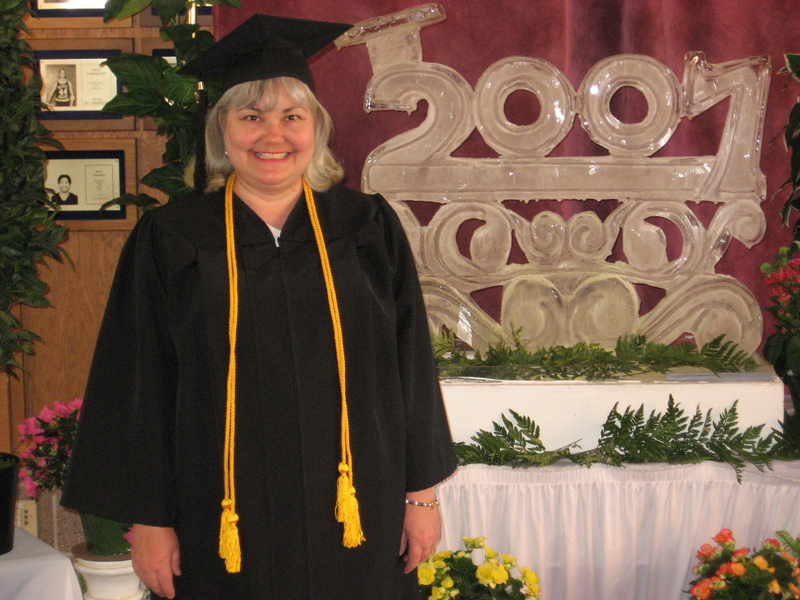 Consider this to be an extension of the previous title, “Midlife Transformation”. I want to use this site to explore how we each define ourselves. Do we know what our purpose is, and are we fulfilling it? If not, what is stopping us, and how can we do it better? Beyond that, I want to discuss our individual “Life Experience Lists” (some may call them “Bucket Lists”). These are the actions and events that allow us to enjoy life to the fullest. What is on your list – the things you have done and the things you want to do? Are you taking actions to realize your dreams? I changed the photograph at the head of this blog to one of my personal favorites. 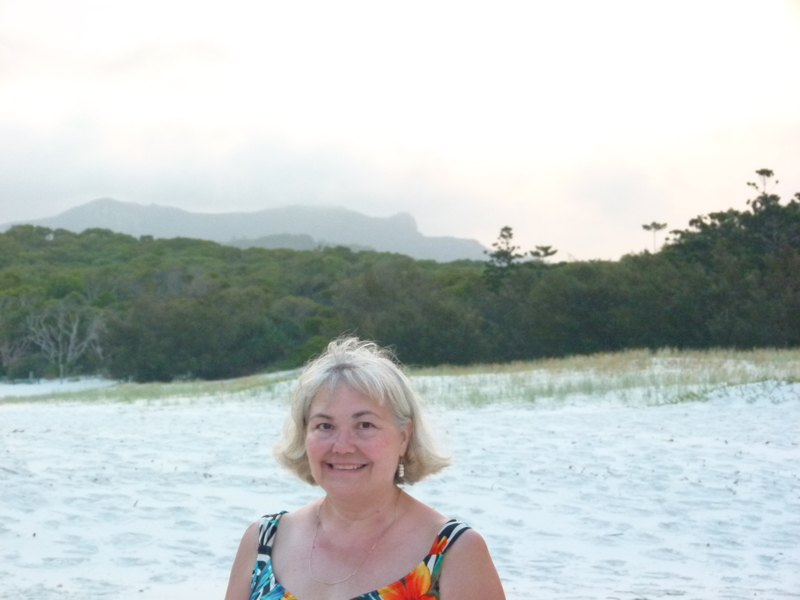 Yes, that is me, standing on Whitehaven Beach in the Whitsunday Islands in Australia. It has to be one of the most beautiful places on earth. I asked my husband to take my picture because “This is what happiness looks like!” I hope you and I both have future adventures and experiences that can bring the look of happiness to our faces. “A major principle in Traditional Chinese Medicine is the idea of meridians, along which qi (or ch’i) flows. As carriers of our vital energy, lifeforce or lifebreath, our meridians supply nourishment and connection for our internal organs, and can have a noticeable impact on our health. I find it interesting to extend the idea of meridians to areas of my outer life, too. I wonder: How is my energy connected to the individuals and community around me? Which of my energetic channels are open and free-flowing? Which channels seem to experience more congestion or contraction? What blocks my energetic self? That piece was written by Elke of Harbin Hot Springs. I am very familiar with the concept of Qi, and I love Elke’s perspective on applying the concept of energy flow to other areas of our lives. Be a Peace Corps Volunteer? Tonight NBC News featured a “Making a Difference” segment about midlife women serving in the Peace Corps. As youngsters in 1961, many of them felt the call when President John Kennedy announced the formation of the Peace Corps. At the time life led them in other directions, but now they are ready and able to fulfill the dreams of their youth. I briefly had the Peace Corps dream as a teenager – I thought it would fulfill a desire to see the world while helping others. But the idea was too big — it scared me — and I never seriously considered it. I admire those who did serve – then and now. I am inspired by women my age who are willing to trade a comfortable life for one of working to improve conditions in poor areas. The Peace Corps is looking for more middle-aged volunteers. Was that your dream in the 1960’s? How about in 2012?